Why is some ice cloudy and other ice clear? Maybe you’ve noticed that the ice you make at home in an ice tray or freezer-held ice machine is always cloudy, while the ice in a restaurant or that you purchase in bags at the local market crystal clear. The short answer is a Commercial Ice Machine. Do commercial ice makers have a magic secret that you’ve never uncovered? Are they using 100% pure water from an untouched mountain stream? Cloudy vs. Clear Ice: What is the Difference and Why? The most obvious reason for ice being cloudy is purity. Water with many impurities, including lime, scale, fluoride, calcium, and other particles will inevitably be more cloudy and milky in appearance. This does not necessarily mean the ice is less healthy, (in the case of fluoride, it actually means the opposite) but it does decrease the clear, clean appearance of ice cubes. To increase the clarity of ice, an ice machine water filter is the number one option to remove all of these impurities. Alternatively, it helps to use highly-distilled water or if you’re making ice at home, you may try boiled water once it is cooled of course. Most people assume that cloudy ice is the result of impure, dirty water. These people are not exactly wrong, but they’re leaving out an important part of the equation: freezing methods. When water freezes, it actually pushes out some of the particles and dissolved oxygen, both of which cause cloudiness. But think about the freezing process in a conventional ice tray or typical residential ice machine. In this case, water in the tray or mold freezes from the outside-in. The impurities and oxygen are pushed towards the center and become trapped within the ice cube. Look closely the next time you freeze a tray of ice. You will notice that the ice in the middle is cloudier than the outside edges and you can usually see some air bubbles. 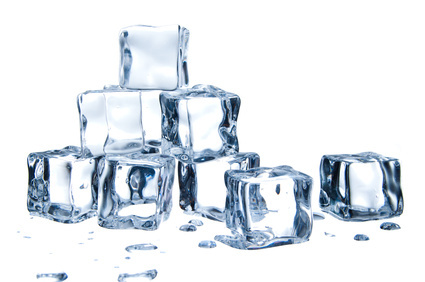 Assuming the water being used is the same, the ice from a commercial ice machine will always be clearer, cube for cube, than freezer ice because the water is frozen from the inside-out. In this case, the impurities and oxygen are pushed outward, eventually being release from the ice. Most ice machines use a waterfall process which builds the ice from one edge of the mold to the other forcing out all of the impurities. While there may not be a lot of significant differences between cloudy and clear ice, anyone that want to serve only the best should seriously consider an ice machine which will create clear ice. There is nothing wrong with cloudy ice, but clear ice has a premium appearance that enhances the drinking experience.